Chris Bradshaw has resigned as manager of Desborough Town. Bradshaw stepped down following yesterday’s (Saturday) 3-0 defeat at Kirby Muxloe in the ChromaSport United Counties League Premier Division. That loss was Ar Tarn’s third in a row following a league defeat to Cogenhoe United and the second semi-final exit in as many years in the UCL Knockout Cup as they lost 2-1 to Leicester Nirvana last Tuesday night. 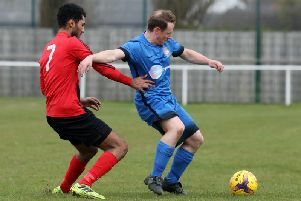 Bradshaw’s spell at the Waterworks Field will be regarded as a success after he led them to a fourth-placed finish in the Premier Division last season while, in the current campaign, they enjoyed one of their best-ever runs in the Buildbase FA Vase by reaching the fourth round. However, he believes the time is right to move on. In a statement released on the unofficial United-Counties League Facebook page, Bradshaw said: “I could say (it’s down to) work commitments but that would be a lie, the true facts are it's the best decision for me and the club. “The board have asked me to reconsider but I can be quite stubborn and when a decision is made it’s made. “The club now in my opinion needs someone to take them to the next step. “I will look back at the last few years at the club with pride and hope the club feel that in this time we have made progression. “To the staff I thank everyone, some great people at the club and will look forward to catching up at some future games. To all the players - good luck and thank you for your efforts every time you have put the Desborough shirt on. “I’ve taken them as far as I can, and the club needs someone else now with a bit more pedigree than me. To whoever the new manager will be, good luck and I hope you can bring lots of success to the club.